Palm Treo 700p Smartphone runs on Palm OS and features high-speed data access through EvDO, 320×320 LCD screen, 1.3-megapixel camera, additional memory compared with Palm Treo 700w Windows Mobile, networking capabilities that allow users to connect laptop to the Internet using the phone’s high-speed data access, switch that vibrates when users have turned off their ringer, integrated thumbable QWERTY keyboard with LED backlight, built-in support for Microsoft Outlook, Hotmail, Yahoo!, AOL, and other POP3 and IMAP accounts, e-mail sync support with Microsoft Exchange 2003 or other corporate e-mail IMAP server via ChatterEmail and Palm 700p is itself also a MP3 player. Technology Evangelist reviewed Palm Treo 700p Smartphone from the perspective of a techie and a businessman and concluded that current Treo owners of the 300, 600 and 650 should take a good hard look at the 700p. While the Treo 600 to 700p migration will be revolutionary, the migration from a Treo 650 to a Treo 700p will only be evolutionary. If you rely heavily on communication, such as being able to get phone calls and e-mail on the go, the Treo 700p is an absolute must. If you are a techie who just likes to play with technology, then the need to upgrade is quite a bit smaller. The Treo 700p combined with ChatterEmail is my business and techie phone of choice. This is the ultimate communication machine. BrightHand writes that it’s disappointing that Palm didn’t do a little more with the 700 series. Seeing as it is currently the 600 pound gorilla of the smartphone market, it could have gotten away with a bit more, like adding Wi-Fi or a VoIP suite as standard. This speaks to design as well — the overall Treo styling hasn’t been significantly altered in two and a half years. While it’s still competitive, it would be nice to see a sleeker and more modern Treo, or perhaps a range of designs akin to HTC’s lineup. All that aside, the 700p is a significant improvement over the 650, and alleviates a lot of the major problems with the last generation Treo. It’s not an enormous upgrade, but is probably enough to tempt many Palm faithful who don’t want to jump to the 700w. Compared directly to its Windows-based sibling, the 700p has its own set of advantages and disadvantages. As always, the best way to judge is based on individual needs. The 700p lacks the Exchange connectivity features and Wi-Fi options of the 700w, but does have a better screen and the classic Palm OS interface. I suspect that despite its flaws, the 700p is going to be a good performer for Palm. Unstrung reviews and compares Palm Treo 700p with Palm Treo 700w and cocluded that performance is significantly and noticeably faster on the 700p compared with the 650. The Blazer web browser continues the tradition of poorly performing, buggy web browsers that has been a hallmark of the handheld computing experience. As a phone, we found the interface a bit annoying compared to the 700w. Now that the 700w has had a firmware upgrade that fixes a lot of the initial teething problems with Windows Mobile 5, it’s a much stronger competitor to the 700p than it would have been a month ago. TMCnet concludes about Treo 700p that it’s worth pointing out that the Treo 650 (Palm-based) was plagued with stability problems and many reboots, so let’s hope the Palm 700w with its newly updated Palm OS 5.4.9 Garnet operating system solves most of those issues. I like the additional memory on the Treo 700p and the streaming audio & video support, as well as the added EvDO and PDF support. In some ways the Treo 700p looks more like an incremental upgrade to the Treo 650, especially since they are using the same speed 312 Mhz XScale processor (though slightly tweaked to run faster with less battery consumption). However, Treo fans will certainly love the new multimedia capabilities which will quiet the Windows Mobile users that taunted this as a key advantage over the Treo. Add in the fact that the Treo 700p supports EvDO there is no doubt that Palm will sell many Treo 700p’s in the near future. PalmInfoCenter reviews the Smartphone and concludes that the Treo is a device that can have a direct impact on your productivity both inside and away from the office. But unlike the BlackBerry the Treo can be much more than just a business tool. It can handle a number of different roles, from a high powered PDA phone, to a portable music and video entertainment device to a pocketable email machine and it does so with ease and style. Palm has ironed out the rough spots on the Palm OS Treo platform, making for one of the top smartphones on the market today. The changes and improvements to the 700p may not be drastic or earth shattering, it is definitely a much more refined device than the Treo 650. 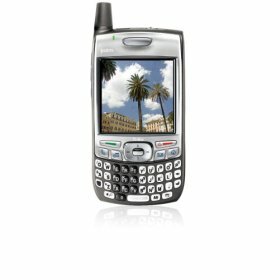 MobileBurn (link dead) reviews Palm’s EV-DO Treo 700p and writes that “I had a tough time coming to terms with the Palm Treo 700p. Overall I like the hardware and its form factor. The 320×320 display is also very nice, and the EV-DO data access to absolutely to die for. But in spite of those things and a very mature suite of applications, I still have a hard time liking the 700p because of the OS and its old fashioned looks and outdated methods for doing things. CNet gives the Palm PDA the editor’s rating of 7.7 out of 10 and concludes that with EV-DO support, increased memory, and enhanced multimedia capabilities, the Palm Treo 700p makes a powerful smart phone even better. Sure, it’s not perfect, but the solid performance and new features make it worth the upgrade. PC Magazine picks Palm Treo 700p as Editor’s Choice with rating of 4.5 out of 5, and writes that Treo 700p offers an excellent balance of phone functions, PIM, media, and high-speed Internet access. It’s a joy to use and will satisfy all but the geekiest feature hounds. For that, it’s a worthy Editors’ Choice. CIO Today (link dead) reviews Palm Treo 700p Smartphone and concludes with rating of 4 out of 5 that for die-hard Palm aficionados who really need the speed, and who can spend $399.99 plus the cost of a two-year service commitment, the EVDO-enabled Treo 700p might be just the thing. For the rest of us, a competing EDGE-enabled product such as T-Mobile’s MDA smartphone might be a tad less speedy but it does incorporate the Wi-Fi and global roaming capabilities that the 700p lacks. Computerworld (link dead) reviews Palm Treo 700p if it’s vacation-worthy and concludes that gadgeteering like this on vacation doesn’t come cheap. Verizon Communications Inc. and Sprint offer the 700p, but to use it as a modem, it’ll will cost you $40 to $60 a month on top of your service plan. And once you throw in fees for premium content, it’s pricey enough to ruin your mellow vacation vibe. NetworkWorld picks Palm Treo 700p as Toy of Summer because if you really need to be connected to the office while you’re on vacation, the Treo 700p offers access to your e-mail, but in a package that also lets you listen to some tunes (via the included music player and SD card support) or browse the Web, since the EV-DO connection allows for high-speed downloads. If your spouse asks you why you’ve brought along a “work device” on vacation, you can point them to the multimedia downloads (such as Verizon’s VCAST or Sprint’s mobile TV service), and just say that you were relaxing. In addition, the 1.3-megapixel digital camera lets you take vacation photos without having to drag along another digital camera.